For those who are following my blog or my students it is obvious: I like to accomplish things! It also makes me very happy if I see other people accomplish their goals! That is why we live, right. To evolve and learn and enjoy life! Not much horse owners think in ‘goals’ if they think about their horse. It’s a hobby so they don’t think it applies. I think it does! Remember why you bought your horse in the first place: to ride, to trail ride, to drive or to have fun with (specify that). Are you? There are your goals. They are just a bit buried and you have to unwrap and reveil them. ‘Riding my horse’, what does that mean to you? Trail riding? Winning dressage competitions? Once a week a lesson with your own horse, ride 3 times a week for 20 minutes or ride 5 days a week for an hour? Do you do what you had in mind when you bought your horse? Yes? Congrats and I want to hear all about it (share it in a comment)! If not, why not? If you know what you want it’s easy to get it. Sometimes you have to dig deeper and ask yourself at least 5 times ‘Why’? This gets you to the root of what you want. Why did you get this horse? Another approach I use in my online goal setting course for equestrians is to find out what you dreamt about before you got a horse? Or go back to your childhood to get clues about your dreams and desires. When you know what you want you can search specifically for the help you need to get it. If you want to ride your horse with R+ or create a stronger bond than you look for an experienced positive reinforcement instructor. If you want to ride competitions you can narrow your search for an excellent rider that has didactic skills to help you too. No one has accomplished great things on his own! You don’t have to. If you get the help you need to accomplish your goals it is time and money well spent! It saves you time, money, frustration and making unnecessary faults (that can impact the relationship with your horse or with yourself!) if you don’t want to invent the wheel again. Don’t worry about ‘skipping the learning process’ there is plenty to learn! I speak out of experience. When you know what you want you can divide your goals into smaller steps. This is one of the 6 HippoLogic Key Lessons (Your Key to Success) for trainers: make a plan. The more steps the easier it is to accomplish them. Write them down, so it becomes very clear. Don’t forget to celebrate each step in order to stay motivated! Step 4: Find yourself an accountability partner! This is where I see things go off track easily. It is easy to make plans, but without coming into action nothing will happen! When nothing happens you will feel bad. If you feel bad you get paralyses and voila: procrastination happens! An accountability partner (another Key Lesson for Trainers) is the one that will help you avoid that pitfall! He or she can also motivate you and help you get new insights and ideas to accomplish your goals. I have helped many equestrians over the years. It works! You need to get weekly accountability in order to make it work. That is what I offer in my membership program. Your need someone to cheer you on and celebrate with you! Who can do this better than the person who knows what your starting point was! In order to stay motivated through the year (some goals take time to accomplish) keep track of your accomplishments. It’s easy to fall into the trap of thinking that you haven’t accomplished much. Your brain is always looking to the horizon (that what you haven’t accomplished yet) and it is very motivating to look back once in a while to see how far you’ve already came! Keeping a training journal and filming your training sessions/riding lessons is a really good way of keeping track. Need help? Accountability or professional support? January 1st 2019 starts HippoLogic’s online course Ultimate Equestrian Goal Formula. You will walk away with a clear goal and a clear training plan to accomplish it. Are you going to make your Equestrian Dream come true in 2019? I help horse owners get the results in training they really, really want with joy and easy for both horse and human. I always aim for win-win! Sign up for HippoLogic’s newsletter (it’s free and it comes with a gift) or visit HippoLogic’s website and join my online course Ultimate Horse Training Formula in which you learn the Key Lessons, Your Key to Success in Clicker Training. PS Did you know HippoLogic has a membership (accountability) program? There are many things you can do to improve the relationship with your horse. Even if you already have a great relationship you can still implement these. Stop labeling your horse and start describing his behaviour. If you use labels you give away your power to listen. If you have a ‘stubborn’ horse, or a ‘lazy’ one or even a ‘smart cookie’ it feels if you don’t have any influence on his behaviour. Nothing is further from the truth. Study horse behaviour and spent time watching your horse. If your horse doesn’t want to come near a new object or doesn’t want to jump over a jump, he is telling you something about his emotions about the object. In order to improve your bond you don’t only have to listen what he has to say, you have to let him know you care. The way you do this is to make him comfortable and increase his courage and confidence about what you want him to do. Your horse has no idea what you have planned for him today and in the future. If you are teaching him something new, make sure you set him up for success and break it down in small steps. Positively reinforce him for every effort he makes, even though it might not look like the end result yet. This is called splitting behaviour in animal training. I teach my students to set and plan their goals so they become very successful. Milestones in horse training are always based on small steps. Strengthen everything you want your horse to do for you with something he likes too. Don’t think only about you want if you value the bond with your horse. The more positive reinforcement you use (the more you give), the more you get back from your horse. All people I know that started using clicker training notice very quickly how much your horse suddenly pays attention to what you do if you use a bit of clicker training. One of my pet peeves is to keep track of your training. This helps you to see how far you’ve come and how much you’ve already improved. This goes for your training as well as your relationship. My horse Kyra was wild when I got her (feral, I mean!). She didn’t want to have anything to do with me or people in general. Now she seeks out human contact and is the barn favorite. How great is her live now because of that! When you keep track (and there are many ways to do this!) you can put where you are now in perspective. We are all very tempted to only look at all things we haven’t achieved yet and that can lead to feeling like a failure. I am a fan of comparing yourself only with yourself, not with someone else. You might compare your worst with someone else’s best. That is not setting yourself up for a proud feeling! Want to get the results in training you really, really want? Want train your horse with confidence? 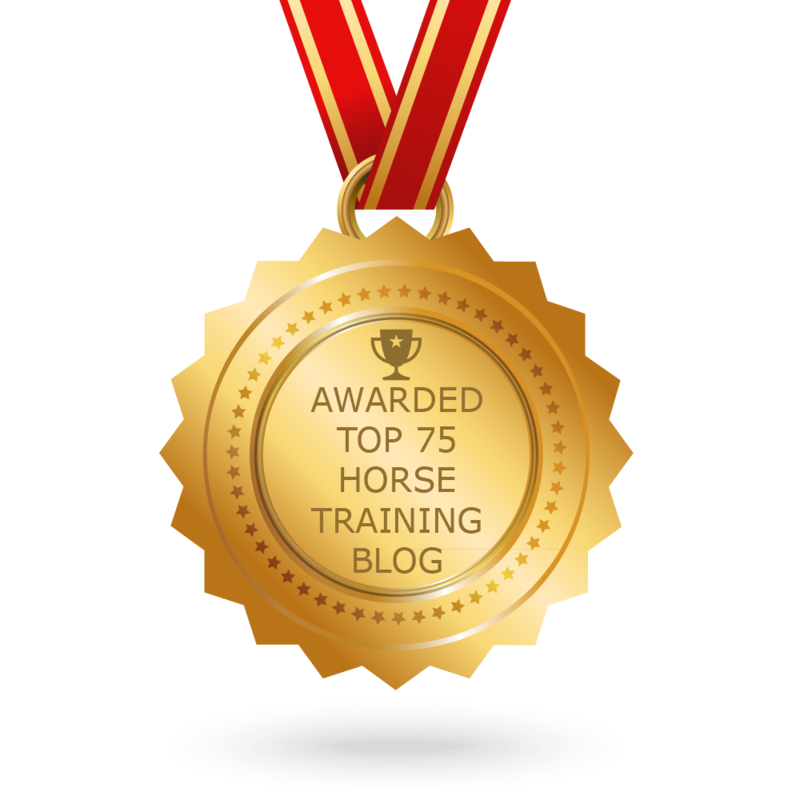 Want to learn all there is to know about training your horse with positive reinforcement? Many horse owners and riders, me included, started out one point in time using reinforcers to train our horses. It doesn’t matter if we used positive reinforcement/clicker training for trick training or more ‘serious’ behaviours like standing for the vet and farrier or in the saddle. Not every one is successful in teaching their horse new behaviours or improve the quality of existing behaviours with positive reinforcement. How to become more efficient when using R+ is what this blog is about. The use of a click to bridge the time gap between the desired behaviour and the delivery of the reinforcer is tip number one when you use reinforcers in training. The horse has to know what made him earn the treat. The bridge signal is also called ‘marker’ or marker signal’ to indicate that that signal marks the desired behaviour. If you know what your goal in training is, write it down and describe it as detailed as possible. When you to it right, you’ve made a great start for your shaping plan. Important is to focus on what you want, not what you don’t want. It sounds like an open door, but how many of us have yelled in despair to our horse: “I wish you didn’t always walk away when groomed.” or “I wish you stopped stepping on my toes” or “I wish you weren’t so nervous around fly spray“. This is focusing on what you don’t want. What you focus on, you create more of! What do you want instead? “I want my horse to stand still while being groomed”,”I want my horse to stand next to me.” and “I want my horse to be relaxed when I apply fly spray”. PS If you want to train your horse to accept fly spray, join this month HippoLogic Clicker Challenge. Two weeks of focus, support and training tips. Describe your goal into as much details as you can think of. Example: I want my horse to stand still and stay relaxed when I apply fly spray. I want my horse to be comfortable with all kinds of spray cans and their content, all kinds of sounds, smells and feels. I want my horse to be OK wherever we are, when I use a spray can or spray bottle on his body, neck, legs and tail. I want my horse to be OK with being sprayed when he is at liberty. I want my horse to be confident to walk away if he doesn’t like it or had enough. If you go into so many details you already can see how you can approach your “spray can training“. You can use different kind of bottles later on in training: start with a plant sprayer with water before you start using aerosol cans that make a hissing sound and from which the content often is very cold. Next step is training in different places (stall, pasture) and so on. Once you have your goal set, you are ready to make a shaping plan. That’s your step-by-step approach of your training. Divide your goal into lots of smaller steps. Make each step so tiny it describes a click worthy moment. The first step can be ‘Horse approaches spray can’, the next step can be ‘Horse targets spray can’. Repeat each step until you see the horse is confident enough before you ask a bit more. Your horse might even increase his own criteria by skipping one of more of the steps in your plan. Don’t forget to click and reinforce when that happens! Last but not least is to keep track of your process and also your progress. If you don’t make progress write down what you changed in your setup so you will remember next time you train a horse. Keeping track is such a valuable habit. You never have to invent the wheel again! Keeping a training journal or logbook will also help you become more creative in finding new angles to training challenges. Writing down your process will also provide you with valuable information of all the things you did well in training! Always keep it positive! That what makes a training journal a good read! Do you set goals, write them down, make shaping plans and keep a training journal? Or do you think this is difficult? What is your approach that helped you become more successful? Share your training tips in the comments! If you think this is a blog that someone can benefit from or if you want to share this on your social media, please use one of the share buttons below. I also love to hear your view on this subject, so please add a comment. I read them all! If you don’t know what to say simply hit the like button so I know you appreciated this blog. Thank you! I help horse owners get results in training they really, really want. Getting results with ease and lots of fun for both horse and human is important to me. Win-win! When I started ‘training’ my free lease pony I had no idea what my plan was. Well, that is not entirely true… I thought I had a plan. When he was born my plan was: “To start him under saddle when he was 4 years old”. That’s it. I was 12 years old. I had no idea how to do it, but I thought I knew. After all, I had read all the books in the library about horse training. Here are 10 tips that I wished I knew back then to set myself up for success, to give myself confidence and motivate me in times of frustration. It would have made my life and that one of the pony (!) so much better. Set a goal and make a plan (see tip #8). Simply start writing in your training journal what you want to teach your horse. Eg ‘standing still at the mounting block’. Writing it down is very important. Focus on what you want, instead on what you don’t want. I hear lots of riders say things like: ‘My horse can’t stand still’. What do you visualize when you read this? You probably see a horse that walks away or doesn’t stand still. Focus on what you want to happen and phrase it that way: ‘I want my horse to stay with 4 hooves on the ground while I mount’. Now visualize it. Is this what you want? Be specific. The more specific you are the better your chances of success. You know what to look for, so you also know when you are successful. In the example above I can be more specific: ‘I want to teach my horse to align with the mounting block and stay with 4 hooves on the ground while I mount. My horse is calm and relaxed when I sit in the saddle and he waits patiently for my cue to walk on.’ What do you see when you visualize this? If you are specific you will know exactly what your training criteria (and you have your training plan) are: 4 hooves on the ground, aligning to the mounting block, standing relaxed while being mounted, wait for a cue to walk on. Find yourself an accountability partner. Someone supportive of your goals and who is not afraid to ask how you’re doing with your goals. If you want a really good accountability partner look for someone who knows more than you do about the subject and can help you specify your goals and help write down your training plan. Find someone who doesn’t judge. Next step is to plan your training sessions. A plan without action is nothing but a wish. You have to know when you want to work on it. Weekly lessons or a monthly meeting with your partner are a great way to make yourself accountable. Use your calendar to plan what you will work on each day. For example training your horse to align along the mounting block on Monday, Tuesday and Friday. By the end of the month you know how much time you spent on training a specific behaviour. Keep your training sessions for new behaviours short and sweet. If you train a new behaviour you only have to work on it for a few minutes. I train max 5 minutes per session when I train a new behaviour. Then I give a break or I ask behaviours that are already understood very well and are easy to perform for my horse, before I go back to train another 5 minutes on the new behaviour. ‘Let’s see if my horse really understands it or if it was a coincidence that he did it’. This is a good time to stop or focus on something else. If you keep going, the behaviour will decrease and you can get frustrated. That is not the best time to stop practising, but you have to. Manage frustration and other negative feelings. If you went on and on until the behaviour gets worse and/or you and your horse get frustrated: please stop. It is better to stop when you feel a little frustrated than keep going. That will never make it better. Forgive yourself, make a note in your training logbook and thank yourself for becoming aware. Awareness is the first step in improving. Celebrate! Share your success with your accountability partner. Celebrate it with yourself and do something you will remember for this special moment. Take a picture or video of the new trained behaviour or share your story on your social media. Hooray! Be proud! Be happy! Use a bridge signal in combination with something the horse wants. Positive reinforcement is the one thing that made all my training so much easier, quicker and more fun too! A bridge signal (or marker) is such a great communication tool. It provides clarity for yourself and for your horse and makes everything you want to train so much easier and with less frustration. I wish I would have learned all this in the riding school I learned to ride, or from all the (five) books the library owned when I was a girl! It would have saved me hours and hours of frustration and prevented me from many dangerous situations. I would be much more confident and saved me a lot of frustration. Me and my pony would have had more fun and a better relationship earlier on. If you think you can help someone with these tips, please share them with the buttons below and help improve horse-human relationships! Thank you. I improve the human-horse relationships by reconnecting you with your inner wisdom and teach you the principles of learning and motivation, so you become confident and knowledgeable to train your horse in an effective and FUN way. Win-win for horse and human. All HippoLogic’s programs are focused on building your confidence and provide you with a step-by-step formula to train horses with 100% positive reinforcement. Sign up for HippoLogic’s newsletter (it’s free) or visit HippoLogic’s website. How to Start Setting Your Goals and Achieve them in 2018! Last week I took my notebook and I sat in Kyra’s paddock to meditate. It was really relaxing and suddenly I thought of some brilliant additions to add to my horse training plan for 2018. I am always on the look out for good ideas about planning or training animals. This time I found it in a business strategy. The planning for the business is based on a theme, a vision and also on values. I never deliberately used a theme in my yearly training plan, but I’ve heard about it for personal planning. Now I moved Kyra to a barn next to the dyke and to access to the beach it was obvious that my theme of 2018 will be ‘trail riding‘. I have been preparing Kyra since she was a yearling: taking her out on the road to get used to traffic, taking her out of sight of her herd (literally one step at the time) to give her confidence to be alone. She was really herd bound in the beginning, but now I can offer her so much, she likes to go with me too. I think she knows she will always get back to her equine friends. The business strategy plan I read was based on values. When I thought about my own values in the context of horse training I discovered I have a lot of (non negotiable) values. The things I always keep in mind during training are: welfare of the horse, clarity, natural behaviour of the horse, safety, fun, learning, trust, positive reinforcement training, control of environment (for the horse), choices, challenges, developing and motivating (in a pleasant way). They might not all be considered ‘values’ in the strict sense of the word, but those are my pillars of every interaction with horses. When I thought of my values in training everything became so clear. It was an epiphany! Wow, suddenly I could just see in front of me what fits in my training plan and training methods and what doesn’t. It was if everything that fitted my values was clear and with a golden aura and everything I don’t value looked dark and in the background. Now it was clear why we aren’t ‘dressage level 4’ yet. This goal isn’t supported by what I value in training and in my relationship with my horse! It was so easy to let that goal go, it was amazing! It gave me such a good feeling. I didn’t have to swim upstream anymore! The business strategy also was based on a vision. I do have a clear vision for Kyra so that was easy to write down. I’ve been writing that down for the past 8 years and it almost never changes. Well… some things drop out such as turning Kyra into a level 4 dressage horse in the usual sense of the word. We already mastered some of the requirements and we will be working on the others. I thought of my vision for my horse before I got Kyra and it was quite a process to get it clear as a bell. It helped me find the right horse for me! I wanted Kyra to be an all round horse. A calm, comfortable and agile trail riding horse to feel safe where ever we go, a wonderful demo horse to give demonstrations positive reinforcement training or give an exciting show with. I wanted her to be strong and prepared to carry a rider, so there is where the dressage exercises (long reins and later under saddle) come in: to help her carry a rider in a comfortable way. I also would like her to be a lesson horse to teach riders to use subtle cues instead of commands. Above all I wanted a horse to connect with. I also added my dreams into my plan, my long term goals are all based on my equestrian dreams. the things I would really like to accomplish with Kyra. Many of them already are reality. I know this because I kept al my plans and my training logbooks from the past 8 years and I made pictures and videos of all my accomplished goals: from walking on the street for the first time, until the first trail ride. Every year I make a training plan for Kyra. I use groundwork (work-in-hand, despooking, horse agility and so on), husbandry, riding, long reins and trick training as pillars. In each column I put a goal that serves my theme (‘trail riding’ in 2018) and is in alignment with my values. I write down what I will work on every month for each of those pillars, so I always have something that I can focus on. Do you make plans? Do you have dreams that you would like to turn into reality? What are those? Please share them in the comments, I would love to know what you want to accomplish with your horse. Thank you and Happy Horse training in 2018! And I have written many more. I like planning because it helps me to be successful. I improve the human-horse relationship. I do that by reconnecting you with your inner wisdom and teach you the principles of learning and motivation, so you become confident and knowledgeable to train your horse in an effective and FUN way. Win-win. All my programs are focused on building your confidence and provide you with a detailed step-by-step formula to train horses with 100% positive reinforcement. The other day I was reading back in my training journal. I was in a bit of a rut and I realized how important my journal really is and what it brings me. I have accomplished more in horse training in the past 8 years, thanks to the use of my journal, than in the 25 years before that. I used to have a ‘diary’ in which I wrote about my training, but it wasn’t helping me. My training journal became a very effective training tool when I changed how I was using it. Here is a little blurb based upon January 9th 2017, ten months ago. It shows why I like using my journal. You will understand why I recommend it to all my clients. The short term goal I wrote down in my journal in January this year was ‘cantering on the long reins over one long side of the arena‘. My pitfall is -and maybe you do this too- is that I have a tendency to move the criteria of my goals all the time. The more progress I make, the more I ‘stretch’ my goal. I keep adding tiny details to it when I almost accomplished it. The result is that I never feel ‘successful’ because I keep changing (adding to) my goal. Sounds familiar? This doesn’t set me up for success, at all! I feel like a failure because I can never reach my goal. It is like the horizon: you can always see it, but never reach it. Pitfall #1 in horse training: people feel like a failure and give up. Success tip #1 Write. It. Down. Is important to set your destination (not be the ‘horizon’) and divide it into smaller, achievable steps. It is important to describe it in detail. In other words: set clear criteria that you can measure. Suddenly it will be clear when you can check off your goal! Write it down! That is so important! You won’t remember, you will add things to it if you don’t write it down. Believe me, I am doing this for 8 years and I never been so effective in my training! I teach my clients this all the time and I see how much it helps them to look back at their goals from three weeks earlier. Then they see that they did make lots of progress and they start celebrating and patting themselves on the back and feel good! It’s awesome to see when that happens. Write down your goal and criteria for that goal before you start training! My goal was: Cantering along one long side of the track. Well, mission accomplished! We can do this now! Yeey us! When I read back in my training journal I realized that cantering on the long reins on a straight line had been a struggle for us for over a year! So I decided I could use a little celebration to motivated me to keep going. In order to celebrate I made a video and shared my success with my best friend, I dedicated a blog post on it and I shared it with my accountability partner. I got lots of praise and checked off my goal with a big green check mark in my journal! Wow, that felt good! My next (short term) goal is to work on ‘a collected canter along one side of the arena’ so I don’t have to run along. I will be satisfied with one stride, then two and so on, until be can do one long side of the arena. That is what I wrote in my training plan. Another goal is to do this at the other long side of the arena (context shift), a separate goal is the other lead in canter and so on. Until everything comes together in a collected canter for minutes and including exercises as a circle. Writing goals down before you start is so important. The more specific you are the better. I tell myself that the criteria I didn’t wrote down or added later don’t count as criterion to celebrate! Make it a habit to write your goals down first! By working on this one goal (‘catering on the long reins’) I provided many smaller, short term, goals for myself. That is what I like best about training: one thing leads to another. Another important thing is that helps me succeed in my training is to keep track of my accomplishments in my journal. I do this by making videos and pictures of our accomplished goals. I tend to forget what our starting point was, which is very human. My videos and photo albums with our accomplished goals are very tangible and keep track of our journey: Kyra, from feral filly to success story. The feeling of accomplishment is MUCH bigger and more satisfying when you see where you really came from (your starting point) than when you only look at your latest achievement, which is always only a small part of the total of your bigger accomplishments. When I am frustrated that things aren’t going as fast as I wish I have to remind myself that Kyra was a real wild horse and the first horse I started under saddle with positive reinforcement. I have to remind myself that I emigrated halfway the process and that this influenced our flow. When I am frustrated the best thing is to take a look at my training logbooks, videos and photos of all our accomplished goals in order to feel better. When I do this I become always are very eager to go to the barn immediately and work on our next (tiny) goal. It's always the tiny goal that leads you to your biggest achievements! My mission is to improve horse-human relationships by educating equestrians about ethical and horse friendly training. I offer coaching to empower you to train your horse in a 100% animal friendly way that empowers both you and your horse. A few weeks ago I stumbled upon a dog trainers blog about using a calendar to keep track of your training days. It sounded really easy to implement and it would help you stay motivated to train your pet. It takes only 5 minutes each day. Enter your email address to follow HippoLogic's blog and receive notifications of new posts by email. Get the results in training you really, really want!